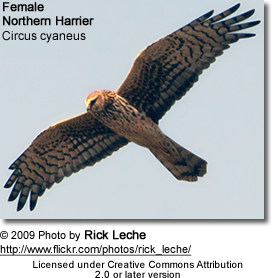 The Hen Harrier (Circus cyaneus / Circus hudsonius) is a medium-sized, widespread bird of prey that is known by a variety of names, such as Northern Harrier (in North America), Marsh Hawk, Blue Hawk, White-rumped Harrier, Cinereous Harrier or Frog Hawk. 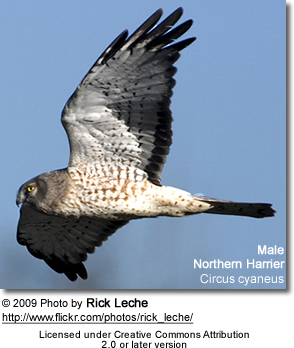 Hen Harriers breed throughout the northern parts of the northern hemisphere in Canada and the northernmost USA, and in northern Europe and Asia (Eurasia). They migrate south to winter in the warmer climates. Eurasian birds move to southern Europe and southern temperate Asia, and American harriers to the southernmost USA, Mexico and Central America. 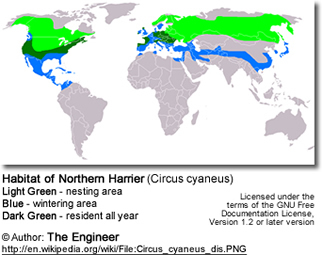 In the milder regions, such as France, Great Britain and the southern United States, Northern Harriers may be present throughout the year, although the higher grounds are largely deserted during the winters. 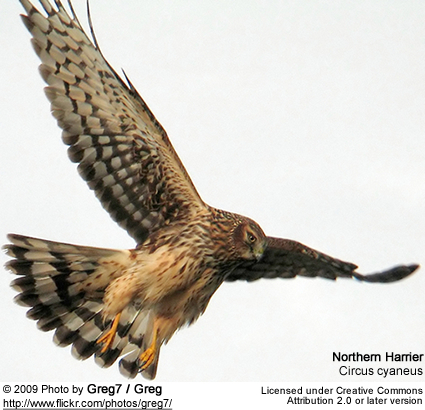 Outside the breeding season, Northern Harriers are typically found in open country, roosting communally with other birds of prey, such as Merlins and Marsh Harriers. In the United States, their numbers are declining due to the draining of wetlands, livestock grazing, flooding and monocultural farming. 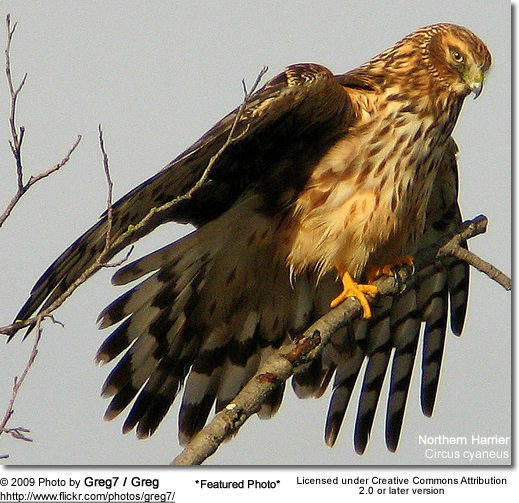 Northern Harriers are now state-listed as endangered in Rhode Island and Illinois and this species is considered threatened in Massachusetts. However, this species has a large range, with an estimated global extent 1–20 million km², and a population estimated at 1.3 million individuals. Therefore, this species is not believed to approach the thresholds for the population decline criterion of the IUCN Red List. Found in Europe and northern Asia east to Kamchatka. They winter from Europe and northwestern Africa through south Asia to southeastern China and Japan. ID: The nominate form is mainly grey above and white below except for the upper breast, which is grey (like the upper plumage). Found in North America, south to northwestern Mexico and southeastern Virginia (USA); winters south to northern South America. ID: The male's plumage is darker grey than that of the nominate form. The female is also darker and more rufous colored. 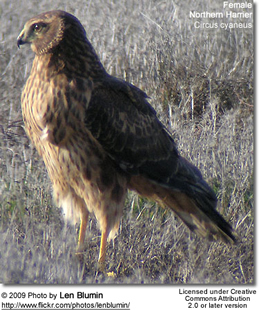 The Hen Harrier measures 18 - 21 inches (45–55 cm) in length and has a 38 -46 inches (97–118 cm) wingspan. Females are generally heavier than the males. Females weigh about 18 oz (530 g) and males average 12 oz (350 g). 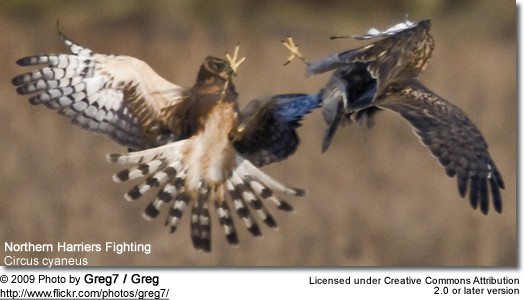 Like other harriers, they have distinct male and female plumages. The nominate males are mostly grey above and white below except for the upper breast, which is grey (like the upper plumage), and the rump (lower back), which is white. The wings are grey with black tips. Females are brown above with white upper tail feathers. 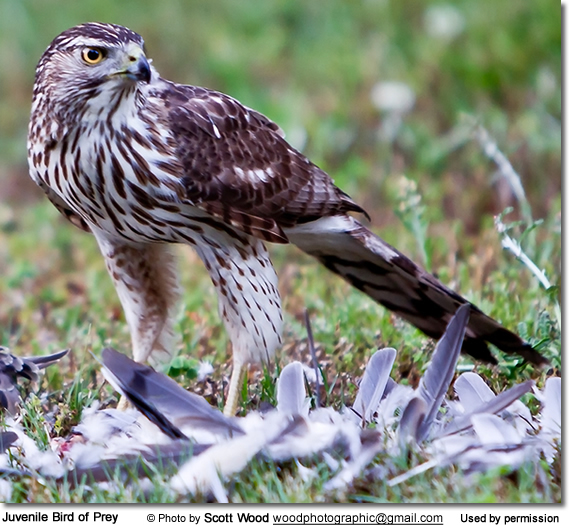 Juveniles - often called "ringtails" - look similar to the female, except their under plumage is buff streaked with brown. 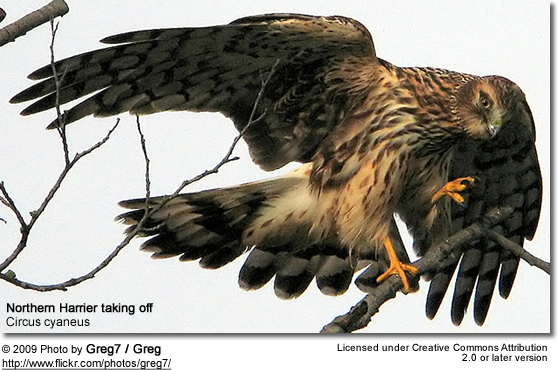 Hen Harriers hunt small mammals and birds, surprising them as they drift low over fields and moors. The female makes a whistled piih-eh when being fed by the male. Her sentinel / alarm call is a chit-it-it-it-it-et-it. 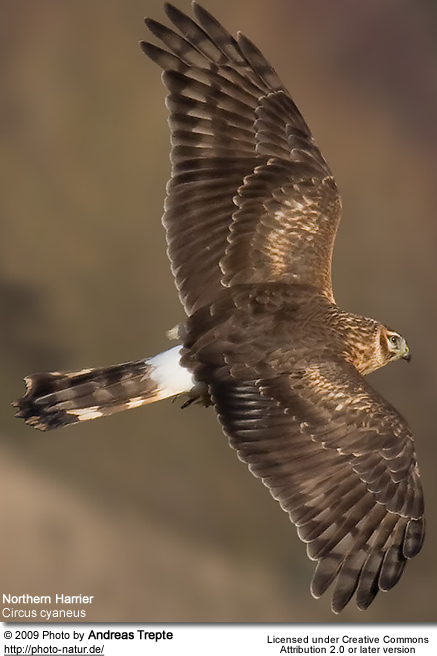 Hen harriers typically breed on moorland, bogs and (in Europe) on farmland. Adult Hen Harrier males court the female by flying high in the air and then dive down twirling and spinning in front of her. The nest is situated on the ground. The average clutch consists of four to six whitish eggs.